Tilissa is using Smore newsletters to spread the word online. 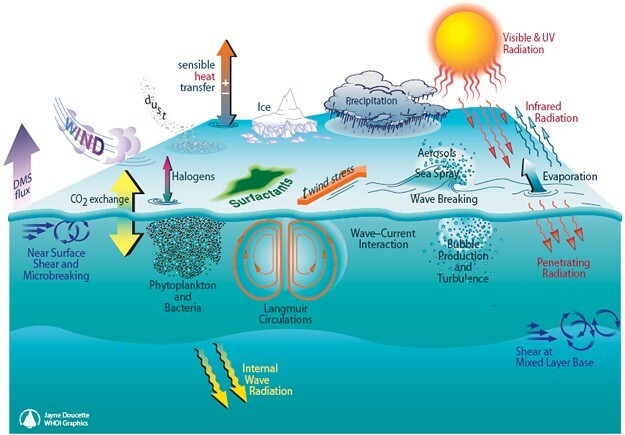 How are the ocean and the atmosphere connected? 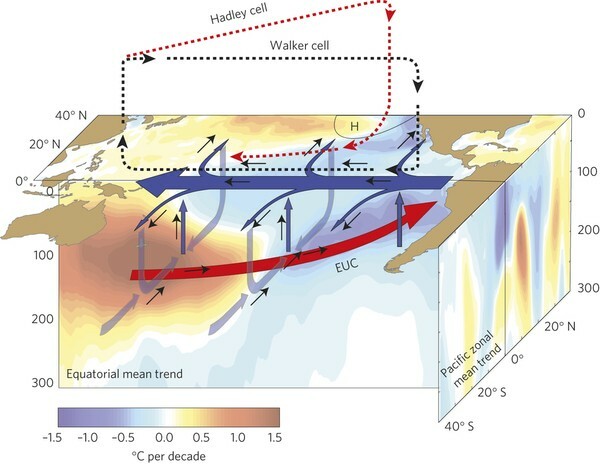 Thermohaline circulation refers to the deepwater circulation of the oceans and is primarily caused by differences in density between the waters of different regions. It is mainly a convection process where cold, dense water formed in the polar regions sinks and flows slowly toward the equator. Most of the deep water acquires its characteristics in the Antarctic region and in the Norwegian Sea. Antarctic bottom water is the densest and coldest water in the ocean depths. It forms and sinks just off the continental slope of Antarctica and drifts slowly along the bottom as far as the middle North Atlantic Ocean, where it merges with other water. 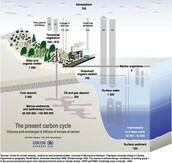 The circulation of ocean waters is vitally important in dispersing heat energy around the globe. In general, heat flows toward the poles in the surface currents, while the displaced cold water flows toward the equator in deeper ocean layers. The major circulation systems of the Earth are illustrated above. 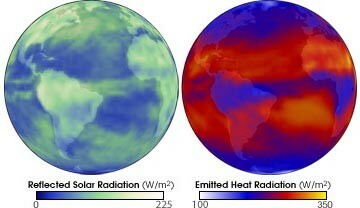 On or near the equator, where average solar radiation is greatest, air is warmed at the surface and rises. This creates a band of low air pressure, centered on the equator known as the intertropical convergence zone (ITCZ). The Intertropical Convergence Zone draws in surface air from the subtropics. Illustration Credit: Tinka Sloss, New Media Studio, Inc. The global carbon cycle shows the carbon reservoirs in billions of tons of carbon and exchanges between the reservoirs in billions of tons/year. The numbers on the figure are annual averages over the period 1980 to 1989. For scientists to understand climate, they must also determine what drives the changes within the Earth's radiation balance. From March 2000 to May 2001, the CERES instrument measured some of these changes and produced new images that dynamically show heat (or thermal radiation) emitted to space from Earth's surface and atmosphere (right sphere) and sunlight reflected back to space by the ocean, land, aerosols, and clouds (left sphere). The image above is from April 2001. The atmosphere affects the oceans and is in turn influenced by them. The action of winds blowing over the ocean surface creates waves and the great current systems of the oceans. When winds are strong enough to produce spray and whitecaps, tiny droplets of ocean water are thrown up into the atmosphere where some evaporate, leaving microscopic grains of salt buoyed by the turbulence of the air. These tiny particles may become nuclei for the condensation of water vapor to form fogs and clouds. In turn, the oceans act upon the atmosphere—in ways not clearly understood—to influence and modify the world's climate and weather systems. When water evaporates, heat is removed from the oceans and stored in the atmosphere by the molecules of water vapor. When condensation occurs, this stored heat is released to the atmosphere to develop the mechanical energy of its motion. The atmosphere obtains nearly half of its energy for circulation from the condensation of evaporated ocean water. Because the oceans have an extremely high thermal capacity when compared to the atmosphere, the ocean temperatures fluctuate seasonally much less than the atmospheric temperature. For the same reason, when air blows over the water, its temperature tends to come to the temperature of the water rather than vice versa. Thus maritime climates are generally less variable than regions in the interiors of the continents. The relationships are not simple. 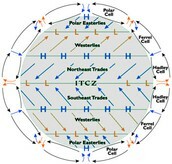 The pattern of atmospheric circulation largely determines the pattern of oceanic surface circulation, which in turn determines the location and amount of heat that is released to the atmosphere. 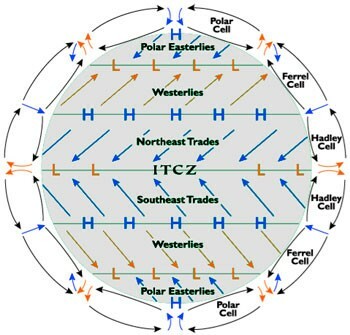 Also, the pattern of atmospheric circulation determines in part the location of clouds, which influences the locations of heating of the ocean surface.